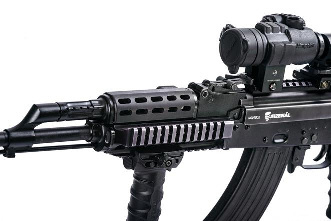 The MoD ARZENÁL Co. is dealing with the modernization of AK-63F assault rifle since the beginning of 2013, using all of its experience acquired in the field of weapon modernization in the recent years. The manufacturing of the original AK-63F has begun in 1964, and its huge advantage, next to other assault rifles, is that it works well between -40 and +50 Celsius degrees. 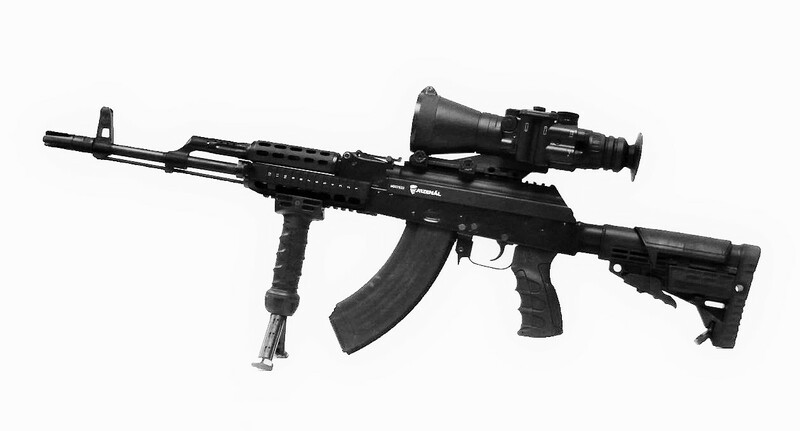 One of its drawbacks was that no optical sight or any other accessories e.g. tactical lamp could be placed or fixed onto it properly. The design of the modernized assault rifle provides the mounting of modern targeting devices and other accessories, thus it creates the possibility of prompt and accurate firing during day- and nighttime, as well as under extreme climatic conditions. On the first figure the original AK-63F assault rifle can be seen. During the development we replaced the original case cover for a new, self made case cover, which contains the NATO STANAG 4694 compatible rail used by NATO. 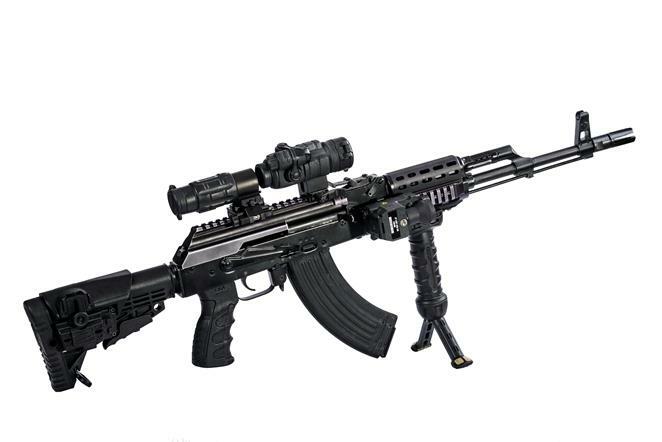 The new name of the modernized rifle is AK-63MA. This case cover is made out of high strength and hard surface aluminium with its surface anodized. 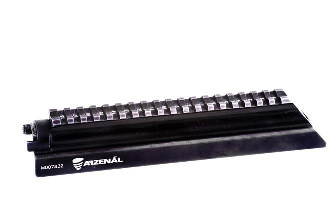 Case cover manufactured by the HM ARZENÁL ZRt. 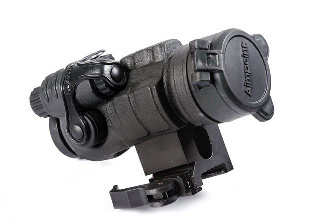 In this case the assault rifle was armed with an Aimpoint Comp M3 2 MOA laser optical sight, an Aimpoint 3xMAG magnifier, an LLM01 Laser Light Module and a Night Optics D – 740 night vision device. The modernized case cover can be removed, thus the weapon can be easily cleaned. The modernization concerns the wooden back grip and the wooden stock as well. The wooden back grip was changed to CAA UPG-47 type plastic pistol grip along with the wooden stock to a CAA CBS & ACP plastic adjustable stock. The wooden first grip was also modified. It was replaced by a unit with three NATO STANAG 4694 compatible rails and a first rail cover. The lower rail makes possible to use several different accessories simultaneously. Such as: tactical flashlight, laser target designator and grenade launcher. With the help of the bipod the accuracy and the applicability can also be improved. As a result of the modernization the weapon became slightly heavier. But it has improved operational applicability and still holds the positive characteristics of the original rifle (simplicity, reliability). The assault rifle was tested in 2015 at the Shooting Range of the Hungarian Defense Forces in Táborfalva, where a test of 15000 fired shots was performed successfully. The tests were designed to prove the assault rifle’s operability, and safe usage. 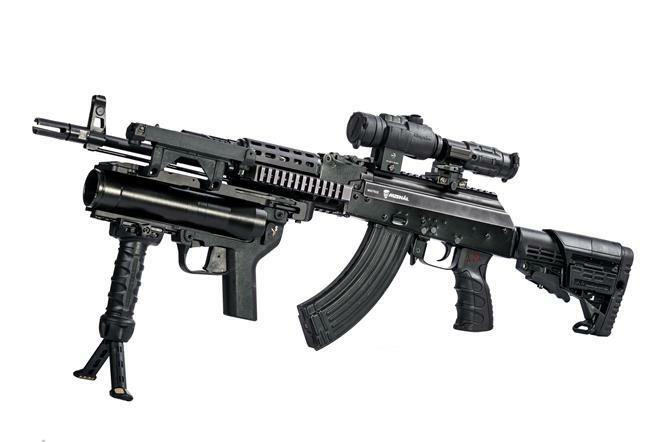 The modernized version was proved to be functioning as desired, and meet all requirements for assault rifle. In order to improve the weapon’s combat efficiency, it can be equipped with a grenade launcher. Results of the Spread test: the hit center does not wander with the modernized parts, the spreading is appropriate, because it is less than with the open sight of the original weapon. Temperatures Tests: The assault rifle functioned with an outstanding reliability under constant low (-38.1°C) and constant high (+50°C) environmental temperature conditions. 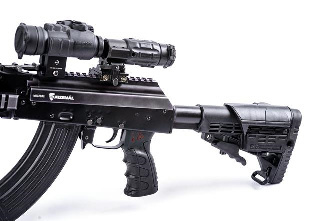 The modernized assault rifle with the new first grip, the NATO STANAG 4694 compatible rail system, and the newly developed and manufactured case cover met all the requirements during tests.